ProClean™ built-under with ComfortLift™ is rated 3.8 out of 5 by 23. 60cm stainless steel built-under dishwasher with ComfortLift™ basket, 8 programs, 15 place settings, inverter motor, SoftGrip and ProClean™ satellite spray arm to deliver superior glass care. Our ComfortLift™ dishwasher lets you gently slide and lift the lower basket upwards. 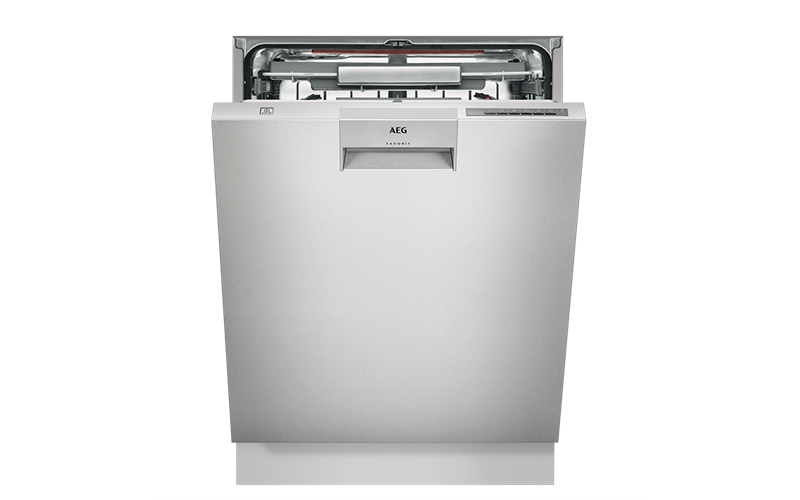 With a dishwasher designed around your needs, you can unload more efficiently and stack more effectively. With ComfortLift we've elevated dishwashing to a whole new level. With ComfortRails you can smoothly slide the basket into place without any rattle of the dishes meaning you never have to worry about damaged glasses again. Always smooth to load and unload. Our AirDry technology lets you maximise your drying performance with natural airflow. The door automatically opens up 10 cm when the cycle is complete. It dries your dishes naturally meaning spotless glasses every time. The glass program in combination with SoftGrip and SoftSpikes protects all glassware from scratches and breakages, leaving them sparkling clean. Rated 2 out of 5 by Sam1234 from Disappointed I originally went into buy a different brand, the Sales man showed me the AEG with comfort lift. He also really pushed that it had a 30 minute quick cycle. I thought this product looked better than what we previously had so we spent the extra money for feature we thought would be great. A month and half down the track every time i use this dishwasher I get frustrated. You cannot load plates into the bottom shelf with the comfort lift up as the plates get stuck on the shelf above it trying to push the bottom shelf back into place or they also get stuck on the side hinges of the comfort lift- therefore i rarely find the comfort lift helpful.As for the cutlery tray, i cannot eve stack half of our cutlery in it due to the tray groves not allowing different handle types. Also other than the 30 minute cycle the other cycles atleast 2 hours 20 mins- 3 hours long. Overall very disappointed and i should have got the brand i was originally going in for. If AEG could provide some solutions to the above problems i may start to enjoy the product a little more. Rated 4 out of 5 by SandyC from Dishwasher I purchased a few weeks ago and am very happy with the performance so far. The only ting I can fault which will only be an issue for us when we have guests is that the cutlery drawer is not that well designed and as we purchased an under the bench we need to secure it which we are having difficulty doing, so I have to hold the dishwasher at the top while trying to unpack it, so that it does not tilt forward, a bit awkward. Rated 3 out of 5 by Margaret G from Limited Washes dishes well but badly designed using up space for cutlery drawer and lower basket lift mechanism. Cannot accommodate large dinner plates without raising the top basket and then wine glasses do not fit. This needs a total rethink to improve the design. Why not bring back the cutlery basket as a starter? Rated 5 out of 5 by Maddii from FINALLY! Finally, we have a dishwasher that works so perfectly that our dishes are absolutely flawless. As though just purchased, never used. Sparkle, Sparkle, Sparkle.